A cold, dark morning awaited us as Rick (my brother) and I left the comfort of our hotel rooms, loaded up our gear and began our 50 minute drive to Huntington Beach State Park in South Carolina. Our conversations were typical and ranged from Myrtle Beach questions to talk about the latest gear. It's always an exciting time for me to be off to a new shooting location and probably the only relief Rick got from my excessive talking was when I occasionally took a sip of hot coffee. Did I mention it was cold? The trip seemed to take forever, but we finally arrived at the park and paid the $5.00 per person entrance fee. The sun was up now and probably a little higher than I would normally like, but it was still low enough to illuminate our subjects with the warm glow I so like in early morning. Directly past the gate, the forest area opened up to a lovely view of a vast salt marsh, and a bridge to cross it. It was here that we saw our first bird. Off to the left, I could make out a tall white bird wading through the salt marsh. From this distance it looked like some kind of egret. As we began to cross the bridge other wading birds came into view. My excitement grew and I wanted to jump out of the van right there, but since no one else was parked here, I continued on across the bridge to the parking area. I don't think Rick was nearly as excited as I was, but I could tell the birds had peaked his interest as well. Since we were past the peak season for tourists, the parking not was empty, but I could see a few photographers and birders milling around. After parking, I jumped out and started breaking out the gear. The Sigma 150-600 was mounted on my Canon 7D and the 7D was mounted on my Manfratto 3221 tripod. I let Rick borrow my Tamron 70-300 VC since he didn't have a telephoto with this reach. With tripods on our shoulders we headed back toward the bridge and settled down for the shoot. 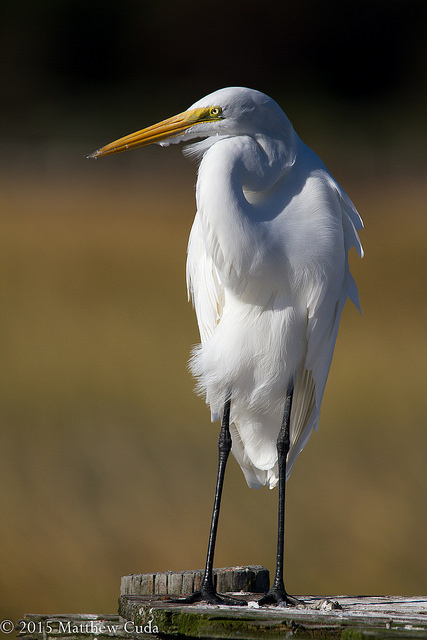 I left my camera mounted on a tripod and lined up the great egret in my viewfinder. The light was beautiful and coming in from the east over the ocean. The egret was lit perfectly, and I began to fire away in 3 shot bursts. The shot below was one of the first of the morning. It was shot at ISO 250, f6.3 and 1/2500th of a second. The auto-focus speed was fast and accurate just I had seen in my initial testing of the lens. I should also note that I did very little to correct contrast since the lighting was so great. It is worth noting that shooting a white bird on a dark background is a bit of a trick. 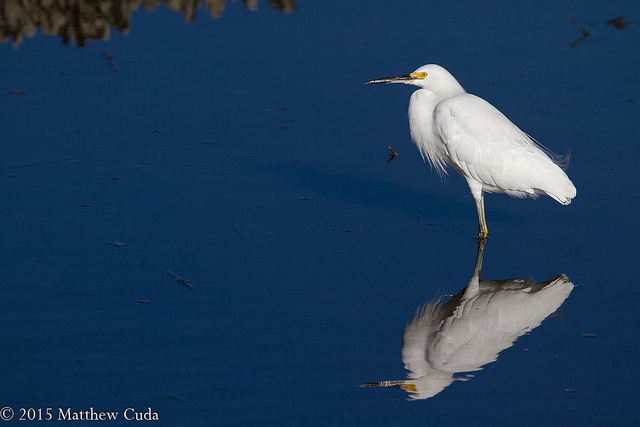 After shooting the great egret for a while I got down low on my belly and started working the snowy egrets. The one I photographed mostly was a young egret as seen in the photograph below. The camera was no longer tripod mounted and I was particular interested in how it performed hand held. Of course, right off the bat the tripod collar was in my way so I spun it around so the foot was on top. The tripod collar can be removed, but since I was shooting both handheld and tripod mounted, I elected to leave it in position. Having a white bird on a dark background is one of the most challenging exposure scenarios a wildlife photographer will encounter. 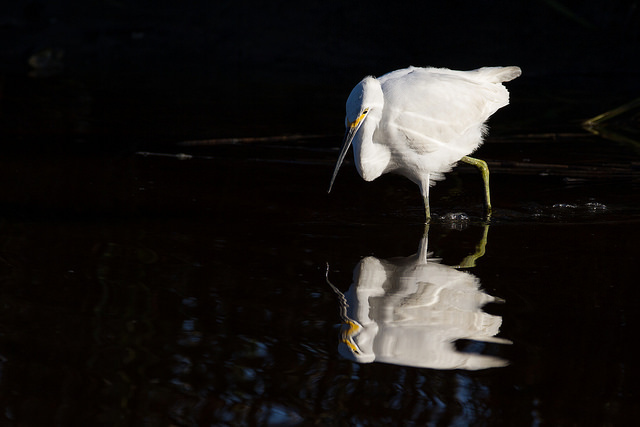 If the bird is completely white, as is the case with the snowy egret, then he can expose for the highlights by spot metering the bird on the side illuminated by the sun. Generally speaking this will give you a good exposure, but may darken the background considerably as it does above. Actually I really like this look for the most part, but you can also bracket your shot to give you a bit more detail in the water. The important part to remember is to not overexpose the highlights too much. If the information is lost in the highlights then you will not be able to recover them in post processing. Rick and I continued to work this area as there were several different species of wading bird congregating here. One of the birds making its way in toward my position was a tricolored heron. I had never seen a tricolored heron in the field before, so this was a treat for me. 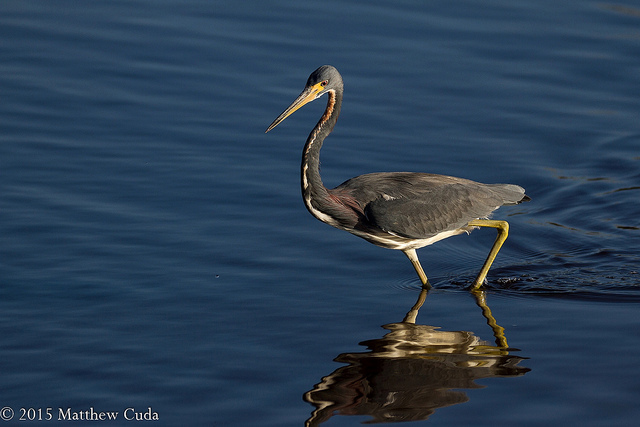 This tricolored heron was also shot handheld at ISO 160, f5.6, 1/1250th of a second. We finished up this area by shooting another bird I had never seen before. 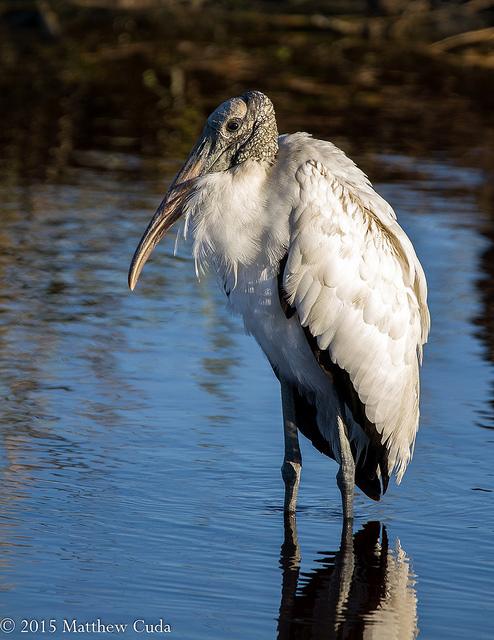 At first I thought it was some kind of ibis, but a local birder informed me it was a wood stork. Here you have kind of an exposure nightmare as you have very bright wings and a dark head. In order to capture this image, I metered for the highlights and opened up a bit to bring out more detail in the head and feet. Because of the need to add more detail in the head, this dropped the shutter down to 1/400th of a second. At this point I was back to being tripod mounted. Moving on from the bridge area, we drove north, to a long pier which extends out across a large section of the marsh. Here we saw more of the same wading birds. Rick got bogged down talking to a local birder so while he was running interference, I began to photograph another snowy egret who was hunting off to the north of the pier. 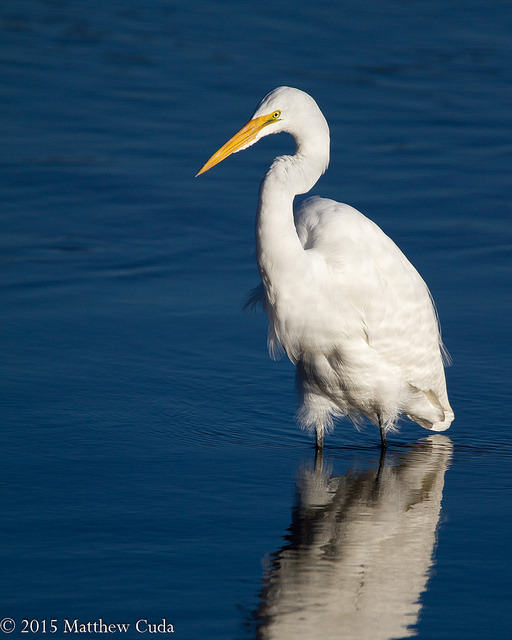 I really liked the shot below as it gives us a nice clean background and a nice reflection from the egret. Rick continued to talk to the birder so I continued down to the end of the pier. Off to the southwest there was a large wooden structure and perched on top was another great egret. The egret was in a fairly interesting position here so I thought I would post the final image. I like the simple background here as well. After photographing the great egret, I waited patiently at the end of the pier just taking in the beauty of God's creation and the salty smell of the marsh. It was such an utterly calming experience that words cannot do it justice. 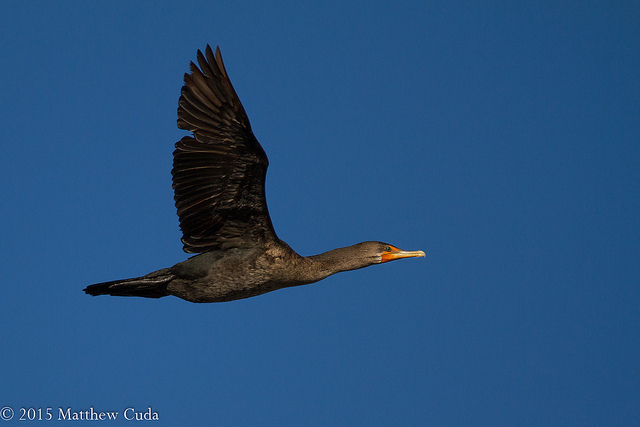 My patience was rewarded by a small flock of black-crested cormorants flying over. I singled this one out for my only bird in flight keeper. I used the center point for focus and the focus speed was decent. I honestly think the new Canon 100-400L would have locked on faster, but I was pleased with the performance. Shot at ISO 200, 1/2000th of a second, f6.3, 600mm. It was about 9:30 now and the sun was moving higher in the sky and would start giving us unfavorable shadows and contrast so we decided to move on. The next stop was "the jetty." This man made structure extends out into the ocean and is often a place where birds congregate so Rick and I thought we should make the trek. We drove up to the far northern parking lot, disembarked and began our 1 mile walk out to the jetty. This beach walk was amazing and beautiful. A beach untouched by the mega hotels and resorts. It was like we were on our own private island. We arrived at the jetty and it was quite disappointing. There were no birds to speak of except for gulls, terns and a few ruddy turnstones. As anyone who is into wildlife viewing will tell you, this is just part of the game. Sometimes you will see a ton of birds and sometimes you will not. 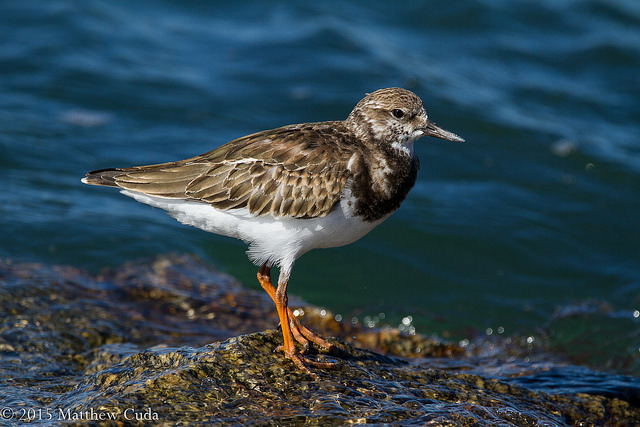 I did manage to make this shot of a ruddy turnstone. Well that was all she wrote for this trip. The sun reached 10:00 am and with it the harsh lighting. Had this been on the west coast we could have continued to shoot shorebirds on the beach, but they were too back-lit this early. Note that once the sun crosses over into the 1:00pm angle you can shoot shorebirds the rest of the day on the east because the beach acts like a giant reflector. Similar to shooting in snow. By the time we made it back to the car we were pretty tired and ready to head back to the hotel. Whatever you do, don't push yourself so hard that you begin to hate photography. I hope to make this scouting trip into a week long trip sometime in the future and overall I was pleased with the amount of birds. The Sigma 150-600 C is definitely a keeper in my book and frankly I believe it would compete with the "L" quality lenses. What I really liked in this shoot was the ability to zoom. There were times it came in really handy and I would have missed the shot with a fixed focal length lens. I also really enjoyed the contrast and colors produced by this lens. Don't be fooled into thinking this lens is second rate just because it is a third party lens. This lens is sharp and in the 300 to 400mm range it is very sharp. Don't forget to check in next month when I head down to Florida for some winter birding photography. Whatever you do, get our there and have fun shooting! Well, I hope you enjoyed the story on Huntington Beach as much as I enjoyed being there. 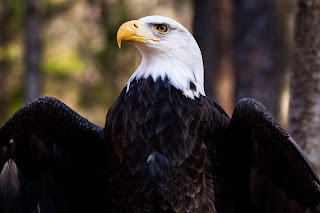 If you enjoy my blogs and newsletters consider supporting my effort by buying one of my fine art images from my Etsy Store If nothing else I hope I inspire you get outside and experience the true wonders that God's creation brings us! I read an interesting blog about letting men be men and boys be boys and that triggered me to do some additional thinking on the subject that I thought I would share. Specifically why do many men naturally have an urge to be "at one" with nature, hunt, fish, and hike? Even men who play games such as World of Warcraft end up virtually hunting, fishing and hiking. It seems to be hard wired right into us, but why? Well, I think to answer that question we have to go all the way back to the beginning. Now, the way some of you believe, going back to the beginning means that you were once a slimy critter making its way out of some tar pit, but for me, being one of those pesky Christians, I am going back to Genesis. Specifically let's go back to Genesis 2. Genesis 2:8 Now the Lord God had planted a garden in the east, in Eden; and there he put the man he had formed.9 The Lord God made all kinds of trees grow out of the ground—trees that were pleasing to the eye and good for food. In the middle of the garden were the tree of life and the tree of the knowledge of good and evil. So now we have man put right there in the middle of a bunch of trees, which of course grew fruit and nuts on them to eat. So now God has solved man's first crisis, which is how to keep his belly full. You know what? Man has wanted to keep that belly full every since. Men love to eat! Genesis 2:10 A river watering the garden flowed from Eden; from there it was separated into four headwaters. 11 The name of the first is the Pishon; it winds through the entire land of Havilah, where there is gold. 12 (The gold of that land is good; aromatic resin[d] and onyx are also there.) 13 The name of the second river is the Gihon; it winds through the entire land of Cush. [e] 14 The name of the third river is the Tigris; it runs along the east side of Ashur. And the fourth river is the Euphrates. OK, you tell me. What is the next thing men like? Water sports such as kayaking, fishing (not in vogue yet), and swimming come to mind. A river running right through eden and splitting off into four other rivers provided quite a bit of entertainment. Specifically God solved several problems: eating, drinking and recreation. Hey maybe Adam even got into a little gold crafting so he could give Eve a nice ring. Wow, no wonder so many men like growing gardens and farming in the great outdoors. This was the primary way man grew the food he needed and gave himself purpose for thousands of years. Only now do we see this once great occupation dwindling away in the face of technology. 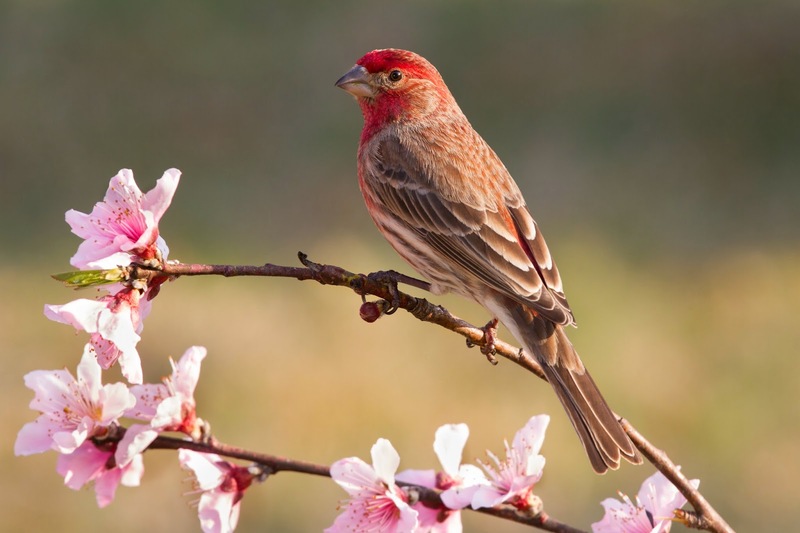 Genesis 2:19 Now the Lord God had formed out of the ground all the wild animals and all the birds in the sky. He brought them to the man to see what he would name them; and whatever the man called each living creature,that was its name. 20 So the man gave names to all the livestock, the birds in the sky and all the wild animals. Well this one is a no brainer! We are still naming animals to this day. In fact, there are whole occupations devoted to naming and observing animals. Did you ever hear of a biologist or ornithologist? We even give the animals fancy latin names because we just can't stop with the common name. I'd say naming critters was hard wired into man right from the beginning. Hunting, although not part of the pre-sin garden is really just a means to attain food and observe nature. 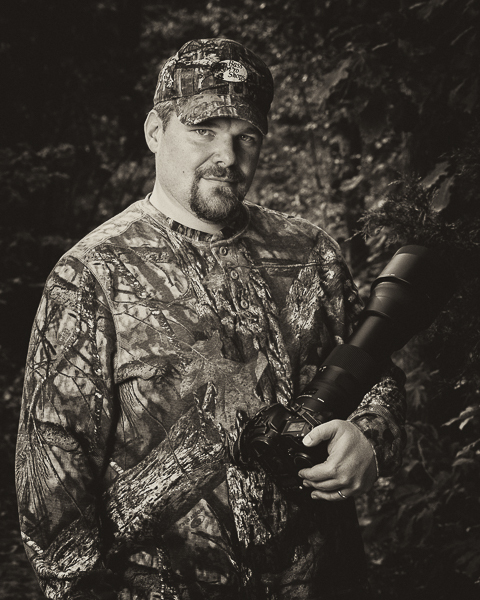 How many men hunt, are into bird watching or like the idea of roaming through the woods in search of critters they have never seen? Can you imagine a powerful bengal tiger or the massive grizzly bear walking up to Adam and looking at him as if he was saying "ok boss, name me." Maybe after he named the tiger, it gave him a little nuzzle and wandered off into the garden. How cool would that have been? Eventually woman was created by God and she was made to complete the man. She did a really good job of it until she and Adam sinned. Now thousands of years later, man still wants to name his animals and tend to the garden, but the woman wants the man to hang out with her. So you see that is why man does what he does. He is being called back to the relationship with God and his duty to name animals and grow things. Now some of this is a little tongue in cheek, but honestly these are the roots of the man. It is still here within us today. Perhaps not as pure as it was then, but it is still there calling to us. Our modern world full of cube farms, social media and cell phones leave little room to accommodate the ancient call of the wild, but we can still get out there and discover what God made for us all those years ago. Yes it is a fallen world so don't expect some tiger to come wandering up to you for naming, but we can still observe and enjoy and I highly recommend doing it. No, I am not saying dump your job and I am not against cell phones. I have one and love it, but do yourself a favor and know when to put the machine aside and just take in His magical creation. I have a slogan in my photography: Creation is Art. If you want to experience real art made from the ultimate artist then step into the forest and let God's art renew your energy and purpose. Just make sure you put some bug spray on because some of his art bites. In my last blog post "Mostly, it's a Shutter Thing", I talked about how important shutter speed is to capture great shots of wildlife and other action genres. 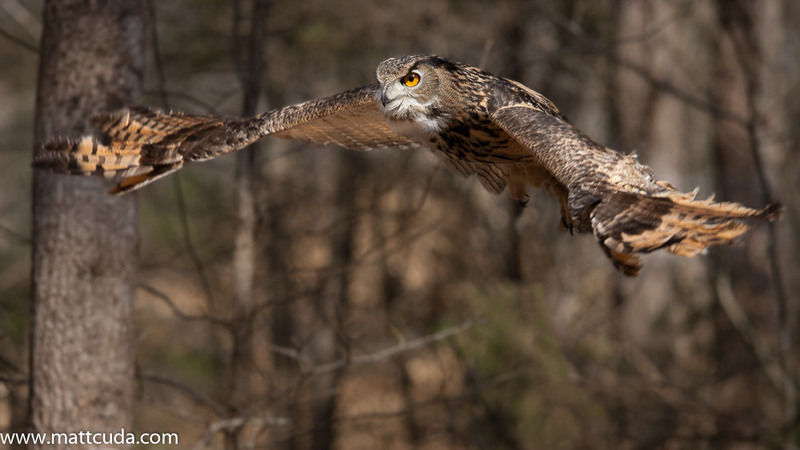 In this post, I will talk about how important aperture is and how it can be used creatively in wildlife photographs. Shutter speed controls how long the shutter stays open and exposes the sensor or film to light. Aperture also controls how the light hits the sensor, and it does this by controlling the amount of light coming through the lens. Back when film was popular, the lenses had an aperture ring on the barrel measured in stops of light. The higher the f-stop number, the smaller the aperture and the smaller the amount of light getting through to the sensor. The lower the f-stop number, the larger the aperture and the greater the amount of light getting through to the sensor. In modern cameras, the f-stop is controlled electronically and for the most part there is no f-stop ring on the lens, but all the concepts are still the same. So that handles the exposure part of controlling aperture, but there is also another benefit to your photography the aperture can provide. This benefit is called depth of field. Put plainly, depth of field is the area in sharp focus in front or behind the subject to which you have focused the lens. High f-stop numbers give you greater depth of field and lower f-stop numbers give you a shallow depth of field. So that photograph of the flower you like, that has a very dreamy and blurred look on the petals, but has a sharp center was created using a lower f-stop. By using this f-stop, the photographer allowed the viewer to see a very small depth of field accentuating the pistil or stamen of the flower. Conversely, that beautiful scenic you love where the entire image is in focus from the foreground to the background is using a large f-stop number like f16. In this scenario, we are usually in a blind or photographing a bird or mammal who has tame qualities. Maybe you are on your belly at the beach photographing a plover for instance. In this case, even at f5.6, you are so close to the subject, your background only needs to be a 15 to 20 feet behind the subject and you start to see quite a bit of background blur. This is one of the main reasons photographers, even with 600mm lenses, get as close to the subject as practical. As the distance from the lens to the subject increases so must the distance from your subject to the background to maintain the blurred background. 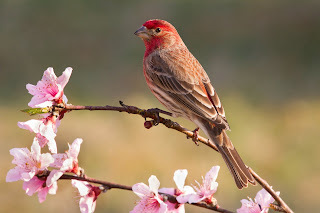 The house finch below was shot only 5 feet from the lens giving the background a nice gradient blur. Even at f8 the background is blurred because of the close proximity to the subject. What does it look like when you don't quite nail it? Although, not a failed image by any means, this image below shows what happens when the distance from the lens, to the subject and subject to the background is too great. Note how we have blur, but not significant enough blur to simplify the background. In this image, I had to actually burn in the background to try to simplify. I really did not have a choice here and often times you won't, but I always try to simplify it whenever possible. Aperture can be use to control your exposure, but also to creatively control the depth of field in the image. This is one of the oldest and most used tools in the wildlife photographer's back of tricks. Give it and try and see what happens. Oh and above all, have fun!